Christmas Magic at Shear Madness Haircuts for Kids! Looking for a Unique Christmas Gift? 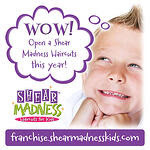 Shear Madness Haircuts for Kids is THE Christmas shopping destination for unique and fun Christmas gifts! Not only do we have awesome kid haircuts, ear piercing and parties - but our stores are filled with cool toys and games, hair products, jewelry and more! And don't forget that Shear Madness also offers Gift Certificates, which makes a great stocking stuffer too! Also, call to order - we can mail to an address you choose, at no additional charge! Plus, with any $35 or more purchase, we'll donate a toy for Toys for Tots (at participating locations)! Wow! Great Christmas Specials: Looking for that perfect Christmas gift for a daughter or granddaughter? If so, glamour, glitz and a whole lot of fun is what you'll get when you plan your next birthday party at Shear Madness! Our Pink Starlets help host your child's party, along with creating fun up-dos, applying make-up and polishing fingernails! It's an awesome experience! For more details, please click Shear Madness Parties! PLUS! Check out our coupon page for even more great deals, like Book a Party in January for 8 or more, and get $25 Off!!! (at participating locations)! Get ShEAR Dazzled for Christmas! Our Ear Piercing is a great experience, and it might be just the thing for an extra magical Christmas! Because we don't just pierce the ears - we make it SPECIAL with Spa Robes, a keepsake plush animal and more! We even pierce both ears at the same time! Our Shear Dazzled Ear Piercing can even be combined with a Diva Day! To find out more (as well as gift certificate options), please click our ShEAR Dazzled page or call your local Shear Madness store! Christmas News: Hot Off the Press! 39,000 "Likes" on Facebook! WOW! To our many awesome followers on Facebook (which is now well over 39,000), we'd like to say a special Christmas THANK YOU to each of you for your great feedback and fantastic photos! You all are GREAT! And if you want even more Shear Madness fun, why not check out our Franchise Blog, Instagram, Google+, Twitter, Tumblr and our favorites pins on Pinterest! Holiday Cheer All Year Long with Shear Madness! 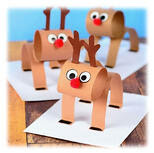 Deck the Halls with these Cool Kids Christmas Crafts! Bring on the Holiday Cheer! Check out our Crafts for Kids section on Pinterest, and learn how to make posicle stick snowflakes, a snowman made from a mason jar, cute little paper reindeer (as seen at left), a salt dough fingerprint Christmas ornament, a no-sew sock snowman decoration, paper plate Christmas trees, beautiful paper snowflakes, funny Santa faces to hang up around the house, and more! Merry Christmas!